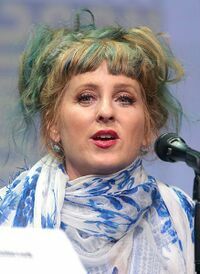 Kim "Kimmy" Robertson (born November 27, 1954) is an American actress, best known for her role as Lucy Moran on Twin Peaks. She voiced Samantha Stanky in the season 3 episode "Bart's Friend Falls in Love". Modified on December 6, 2017, at 10:38.